Catholic leader pays homage to victims of Holocaust during liquidation of Vilnius ghetto 75 years ago. Pope Francis on Sunday paid homage to Holocaust victims who perished in the Vilnius ghetto, 75 years to the day after the Nazis liquidated it, and warned 100,000 Lithuanians gathered for mass against "pernicious attitudes" leading to genocide. 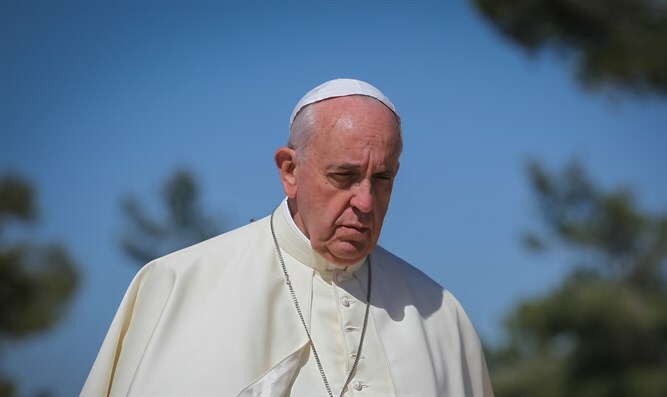 "Seventy-five years ago, this nation witnessed the final destruction of the Vilnius Ghetto; this was the climax of the killing of thousands of Jews that had started two years earlier," the pontiff told faithful in a homily in Kaunas, Lithuania's second city. Pre-war Lithuania was home to a thriving Jewish community of more than 200,000 people, with its capital Vilnius a hub of learning known as the "Jerusalem of the North". According to historians, around 195,000 -- nearly the entire Jewish population -- perished at the hands of the Nazis and local collaborators under the 1941-44 German occupation. Today around 3,000 Jews live in the European Union and NATO member state which has a population of 2.9 million, the majority of whom are Catholic. Recalling the Holocaust, Francis prayed for divine "discernment" to alert the faithful to any reappearance of "that pernicious attitude, any whiff of it that can taint the heart of generations that did not experience those times and can sometimes be taken in by such siren songs." The pope also said he would pay tribute to Holocaust victims at the Vilnius ghetto memorial later on Sunday at ceremonies marking the 75th anniversary of its liquidation. "In these days, I reserve a special thought for the Jewish community," the pontiff said, calling for "dialogue and the shared commitment for justice and peace". Francis will travel to mainly Protestant Latvia on Monday and secular Estonia on Tuesday as all three Baltic states mark 100 years of independence this year.